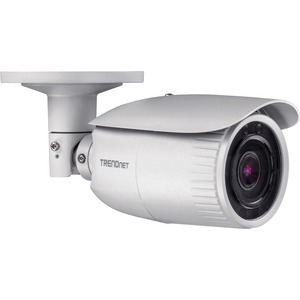 TRENDnet's Indoor / Outdoor 4 MP Varifocal PoE IR Network Camera, model TV-IP344PI, provides powerful 4 MP HD night vision at 30 fps in complete darkness for up to 30 m (100 ft.). This IP66 weather rated camera features auto-focus / optical zoom which provides installation flexibility and time savings. Use the included pro-grade software to manage up to 32 TRENDnet cameras or download the free iOS® or Android™ mobile app.